The Facebook F8 2918 conference is currently being held in San Jose, California. This is a two day event (1st to 2nd May), aimed at developers but we see plenty of news of interest to consumers too. For those interested in the whole gamut of information presented by Facebook at F8 there is a dedicated page here with videos and news releases from F8, including Mark Zuckerberg’s keynote speech. Below I’ll be concentrating on the consumer facing news of the release of the Oculus Go, Facebook Dating, and moves to improve privacy. The Oculus Go is a standalone VR headset. It doesn’t need a computer, a smartphone, or headphones, it is truly a standalone wireless device. The Oculus Go was first announced back in October last year, so there’s nothing big new today other than the device becoming available in 23 countries, and therefore some sites have already uploaded reviews of the device. One further nice touch is that Facebook has added 21 new games and apps to the roster of about 1,000 that can be used with this headset. 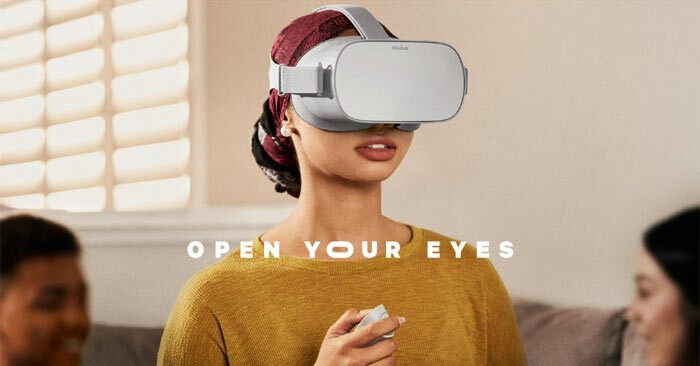 To recap the capabilities of the Oculus Go; this Snapdragon 821 powered device features 3DOF (degrees of freedom) head tracking, best-in-class optics (with prescription lens inserts available), a wide field of view, and good ergonomics, a fast-switch LCD screen at 538ppi 2,560x1,440, built-in speakers, an easy to use controller, and a companion app for finding and downloading apps and content. A fly in the otherwise creamy ointment seems to be that the battery life of the Go is only approx 2 and a half hours, meanwhile it will take about 3 hours to fully charge the 6000mAh Li-ion battery it uses. You should not charge the headset while it’s on your face. Facebook is offering both a 32GB and 64GB storage version of the Oculus Go, priced at $199 and $249, respectively. 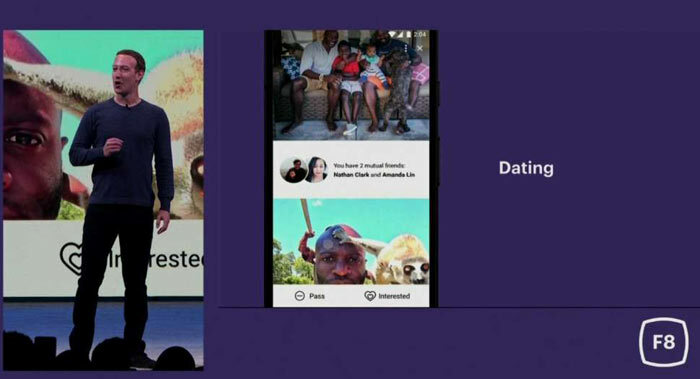 Facebook Dating was another big announcement at F8 yesterday. “There are 200 million people on Facebook who list themselves as single,” said Mark Zuckerberg. He went on to say how Facebook would aim to build meaningful relationships via its Dating feature. As the US stock markets closed for the day, Match.com was clearly a casualty of the F8 announcement as its price fell 22 per cent, reports the BBC. User privacy is something that needs close attention at Facebook. This is clear to see in the wake of the Cambridge Analytica scandal(s). Thus Facebook is working on a new Clear History tool, among other initiatives. Still some months away from release, the tool will let users see third party data collection activity, provide the ability to delete this information, and prevent future collection of such information. Missed opportunity to shape it like a book. That battery won't last long once all the mining ads take over! Even though it is standalone, can it still be tethered to a PC for gaming? If it can then I might be interested in this as something to use for a while until the mainstream PC headsets have evolved a bit and become more affordable, I would see this a PSVR alternative for PC users (with a few extras) at that price, but if it can't tether to devices, then it isn't for me. With this and their dating app (as well as an app purely to find you more apps to download), they aim to bring the world together and… err… doing… whatever people do when they umm… get together…..?